The Casino allows you to park here for free. We did eat in the restaurant and the service was excellent and the food was above average for sure. We will stay here again. We camped at Kla-Mo-Ya Casino in a Fifth Wheel. The staff and owner are excellent and treated us like family. We were impressed that they were concerned that everything was working well and we were satisfied with our stay. "Chuck" was helpful in getting us set up and showing us around the park. We will definitely stay here again. We stayed seven nights. They are very dog friendly. 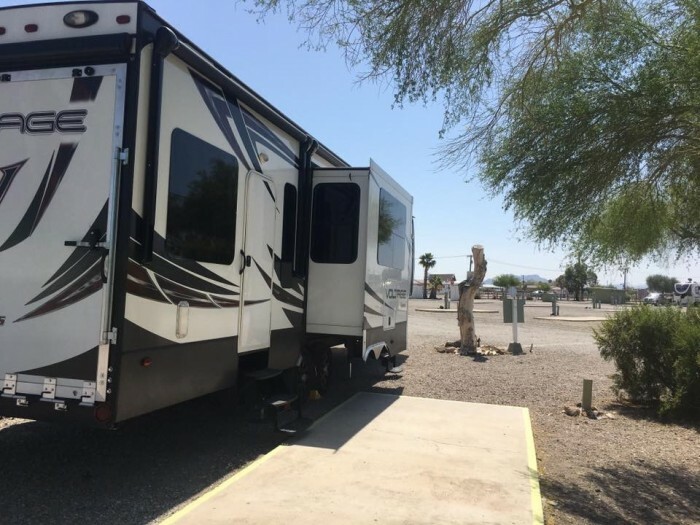 We camped at The Scenic Road RV Park (55+ park) in a Fifth Wheel. This is a county park that is very quiet and secluded. It is small and reservations are recommended. There is one shower in the men's and women's restroom, they are very clean as are the sites, they are well maintained. This is a great park for hiking and exploring the desert, with lots of hiking and off road biking. We camped at White Tank Regional Park in a Travel Trailer. I would recommend the waterfall trail to see where the Native Americans in this area lived, petroglyphs and etc. Very clean campground and great place to camp if your visiting Summer Lake Game Reserve. The owners, while there, are very helpful and friendly. They also have great help in the winter time. The park has about 32 sites, 8 are full hook ups and 16 partial hook ups, electric and water, and 8 tent or no hook ups. All sites are pull through and easy to navigate. It's a small park and the showers, toilets and laundry are easily accessible. We camped at Ana Reservoir RV Park in a Travel Trailer. There are many things to do in the area besides the bird refuge, Fort Rock, Christmas Valley are just a few of the places to visit. Bird watching at Summer Lake, hunting and fishing. We stayed on the river in the no hook up sites. Had great site right on the river. The hookup sites also looked very good, but we didn't stay there. Spent two nights here and would stay again. We camped at Davis Camp Park in a Travel Trailer. This park is basically a place to park you trailer/motor home. There are no picnic tables and the units are parked close together. The worse part was the sewer hookup, or lack of. You basically stick your sewer line into a shared sewer hole. We just dumped the tank and didn't leave the line hooked up. It's a recommendation if you stay here. We camped at Las Vegas KOA at Sam's Town in a Travel Trailer. Clean bathrooms and showers, average exercise room, wi-fi is almost non-existent. Some of the events (BQ, and etc.) are poorly run. Our rate was monthly divided 31. We camped at Rincon Country West RV Resort (55+ park) in a Travel Trailer. We stayed here two nights on our way to Arizona. We found the park refreshing with friendly staff and tenants staying here. Great place for ATV folks. 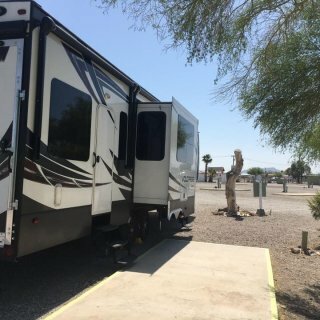 We camped at Calizona RV Park (55+ park) in a Travel Trailer.